Paved areas of your landscape are exposed to various elements which may make them prone to damage. Rain and moisture can encourage molds, mildew, and weed to grow on them. Stains, grime, and dirt can stick to the surface of pavers, and constant usage could cause some parts to chip off or break. These are the reasons why paved surfaces, like driveways, patios, decks, and walkways, require regular maintenance. Fortunately, we at Four Seasons Landscape Management provide paver cleaning and sealing services to various areas in Georgia. Give us a call and we will be more than happy to provide you with whatever paver maintenance service you might need. 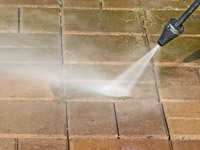 We conduct paver cleaning as if we are cleaning our very own paved surfaces at home. We make use of only the best cleaning equipment, depending on the type of paver material used and the level of cleaning necessary. We make use of high-pressure washers that blast jet streams of water towards the surface to remove stubborn dirt, grime, and molds. For those that are harder to get rid of, we make use of industry-standard cleaning solutions which are safe for most paving materials and for the people around the area being cleaned. We make sure that every paver cleaning product we use is eco-friendly, strong enough to remove dirt and grime but mild enough not to damage the actual paved surface materials. Sealing a paved surface not only provides protection, it also enhances the look of your paved areas. There are many advantages to paver sealing. Applying sealants makes the surface safe from color fading, corrosion, stains, and mildew. Paver sealing also extends the life span of the paving material used, while giving it a deeper color and slight gloss. Sealants can be applied with a roller, a brush, or a sprayer. There are two kinds of sealers used for paved surfaces: "film formers" and "penetrants". Film formers provide a glossy finish on the surface of a paved area, protecting it from water, stains, and stubborn dirt. Meanwhile, the latter type of sealer penetrates into the paving material to strengthen the surface and prevent mildew and weed from developing. When it comes to protecting your outdoor surfaces, the paver cleaning and sealing services that Four Seasons Landscape Management provide are something you could truly count on. Contact us now so that we can start making your paved areas clean and properly sealed. We want to help you enjoy your beautiful and clean outdoors with our reliable paver maintenance services.